Syed Waliuliah’s Chander Amabasya (1964), rendered by Afia Dii as Night of No Moon, narrates the story of a young man whose world of innocent dreams collapses when he is forced to enter the world of experience. Arif Ali, a young man of twenty-four, has come from a village to work in a primary school in a small mofussil town. One dark night he stumbles upon the dead body of a murdered woman. His romantic idealism and his love of life keep him from acknowledging stark reality and he even thinks of forgiving the murderer whom he knows. But this very love of life and loyalty to truth finally give him the courage to expose the murderer though he realizes that by doing so he is signing his own death warrant. 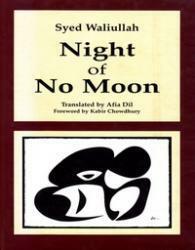 A brilliant, though dark, story looking into the depths of the human soul, Night of No Moon is a significant addition to Bangladeshi literature in translation and a must read for everyone interested in the study of human problems.